Photographer Jobs-Create Your Free Service Profile to quote. Are you searching for Photographer Jobs? Are you a photographer available for work? If you are a photographer and are looking for Photographer Jobs, you have reached to the RIGHT place! 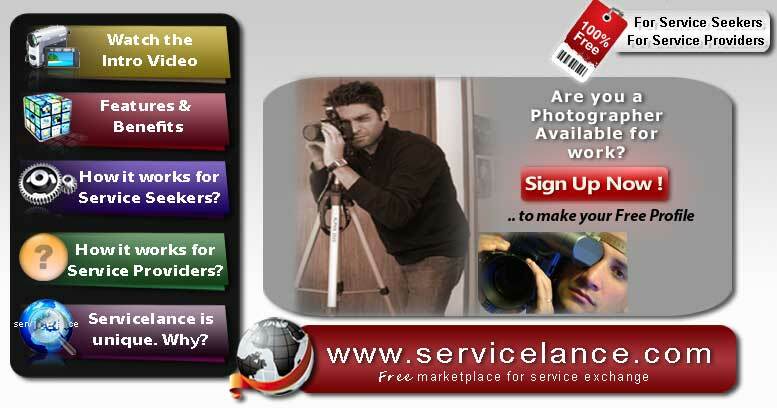 Either you own a photography business or you offer your photography services as an Individual / Freelancer, you can make your FREE Service Provider Profile at Servicelance and get notified of any photographer jobs posted at Servicelance in your local areas of services.Thats EASY & FREE! Free exposure to seekers who are looking for photographers for their events & jobs. Offer Photographer services as an individual, freelancer, self employed or a business. Write articles & help establishing and promoting your professional repution. Get notified for any Photographer Jobs posted at Servicelance, through Job Alerts sent to your email, again for Free! Quote Freely on any number of jobs you feel interested in. Close deals with seekers as you prefer-Get paid quickly and directly. - No credit cards required. - No escrow setups required. Give a boost to your Photography Profession Now. Click here to Get Started! Looking for Event Photographers for your event?